"We stand behind all those who wear the NAPD badge." 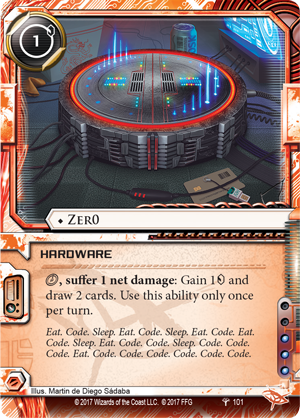 Android: Magnum Opus and the final Android: Netrunner World Championship are now just a few weeks away! As these events look to draw a close to the game's Organized Play, the developers have assembled a new Most Wanted List (pdf, 6.5 MB) to promote greater diversity among the game's Corps and Runners—and to ensure that the game ends in a healthy place to reward continued play, even after its Organized Play has concluded. What do these changes entail? For that information we turn to developer Michael Boggs. As we worked on this latest Most Wanted List (MWL), our team and playtesters faced a special challenge. Previous MWLs all followed the same key philosophy—to address problems in the meta, while keeping the list contained and welcoming to new and returning players. This MWL, however, is our last, and we’ve decided to tweak our philosophy accordingly. We still want to keep the list contained, but we felt it was more important than ever to promote a meta that is healthy and long-lasting. As a result, MWL 2.2 is the most aggressive iteration of the list to-date, featuring a number of restrictions and removals on both sides. Clone Chip is coming off of the Restricted list. Mad Dash is taking its place. Clone Chip: Taking Clone Chip off will boost the Shaper faction and Freedom Khumalo, providing both with useful flexibility. This also allows for Clot resurgence, helping to slow Arella Salvatore chains and Titan fast advance, while the boost to Freedom diversifies Anarch’s identity options. 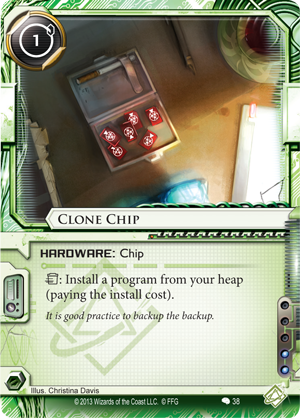 On the whole, taking Clone Chip off the Restricted list should encourage a welcome measure of exploration throughout the Runner side of the game. 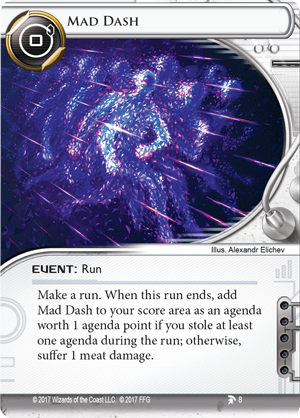 Mad Dash: The extra agenda point from this inexpensive run event gives the Runner a significant amount of value against nearly every Corp archetype. In conjunction with cards such as Indexing, Mad Dash can end games quickly. As such, it has been restricted as a general way to slow Runners. Hyperdriver, Mars for Martians, Zer0, and Tapwrm are now removed. Hyperdriver: Hyperdriver enables decks that spend and abuse a massive amount of clicks in one turn. Corps have little way of responding to this style of play, meaning that Hyperdriver decks introduce a negative play experience that is harmful to the larger metagame. Mars for Martians: This has been removed to slow Liza Talking Thunder tag-me builds. Tag-me Liza builds will continue to be strong, though they will no longer be able to gain twenty-plus credits in a single click, forcing them to work a little harder for their Counter Surveillance dig. Zer0: Zer0 has been removed to break up the Anarch’s hottest couple. Both Zer0 and Clan Vengeance were discussed as potential candidates, but Zer0 was ultimately chosen for two reasons. First and foremost, before Zer0, Clan Vengeance existed on the fringe. It was part of strategies that were difficult to successfully pull off but that were exciting if you could do so. Secondly, Anarch has arguably the strongest economic potential in terms of credit gain, card draw, and click compression of all the Runner factions. As such, Zer0 gave Anarch both an oppressive synergy and an economy boost that they did not need. Tapwrm: Tapwrm is being removed, partly due to its synergy with Clone Chip, which is being taken off the Restricted list, and partly to force Runners to find a more diverse set of economic solutions. While Tapwrm isn’t the clear choice for every deck, the decks that do run it can often put the Corp in a lose-lose situation. 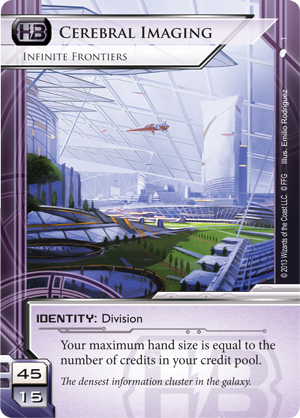 Bryan Stinson, Potential Unleashed, Skorpios Defense Systems, and Surveyor are all being restricted; Violet Level Clearance is moving from Removed to Restricted; and Fairchild 3.0 is coming off of the Restricted list. Bryan Stinson: Bryan is the centerpiece of many exceptionally swingy turns and strategies. 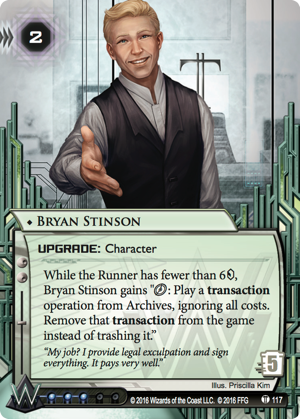 If the Runner dips below six credits for even one turn, Bryan can allow the Corp to gain such a massive economic advantage that it effectively ends the game right there. Potential Unleashed: The entire plan for Potential Unleashed revolves around locking the Runner out of servers, something that is really no fun for either party. While this style of play certainly has its place in the game, Potential Unleashed is able to do this all too frequently. Placing Potential Unleashed on the Restricted list still allows for the lock-out style of play but forces the Corp to choose between the identity or Jinteki’s other powerful tool, Obokata Protocol. Skorpios Defense Systems: Skorpios is not being restricted because of its power per se, but because it is one of the identities most prone to negative play experiences. Either Skorpios does absolutely nothing to the Runner or it wrecks their deck—there is no in-between. Playing against Skorpios can oftentimes feel like a coin flip. Placing Skorpios on the Restricted list alongside Hunter Seeker should limit the most abusive uses of the identity and encourage future Skorpios players to explore alternative strategies. Surveyor: Surveyor simply turned out to be stronger than anticipated. If it were three or four influence, it likely would not be Restricted. It’s really a lesson on why higher influence costs are usually better for the game. 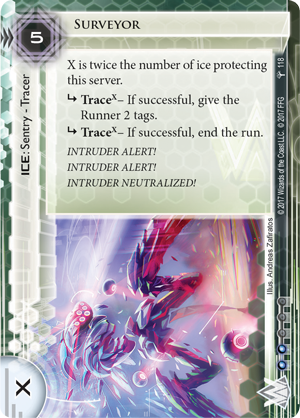 As it stands, however, Surveyor has become the premier piece of ice for nearly every deck wishing to run some semblance of glacier. Violet Level Clearance: Violet Level Clearance was initially removed to slow Cerebral Imaging. While its removal certainly had an impact, it wasn’t as effective as expected. VLC is still extremely efficient, however, and has moved to Restricted for that reason. Fairchild 3.0: Though Fairchild 3.0 is a very strong piece of ice, it’s not quite on the same level as Surveyor. With Surveyor being added to the Restricted list, Fairchild 3.0 is coming off to ensure that glacier keeps the tools it needs. 24/7 News Cycle and Cerebral Imaging are being added to the Removed list; Estelle Moon and Museum of History are shifting from Restricted to Removed. 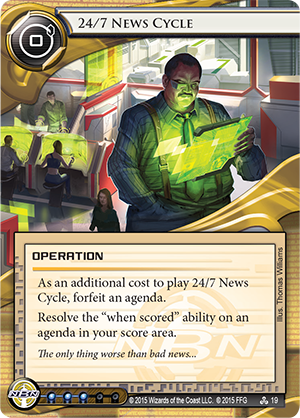 24/7 News Cycle, Estelle Moon, and Museum of History: These cards are all going on the Removed list for the same reason: when they work well, they lead to Corp advantages that the Runner has limited ways of disrupting. And, of course, these cards often work very well. Cerebral Imaging: Even when Violet Level Clearance was on the Removed list, Cerebral Imaging still dominated. More than this, balancing the identity is incredibly difficult; when we limit one build, another springs up almost immediately. For this reason, we’ve decided that it’s better to take CI out of the competitive environment. Before I go, I want to say that it’s been an absolute honor working with this community. I simply cannot express how awesome it has been to have met, talked to, and playtested with so many amazing and passionate people. 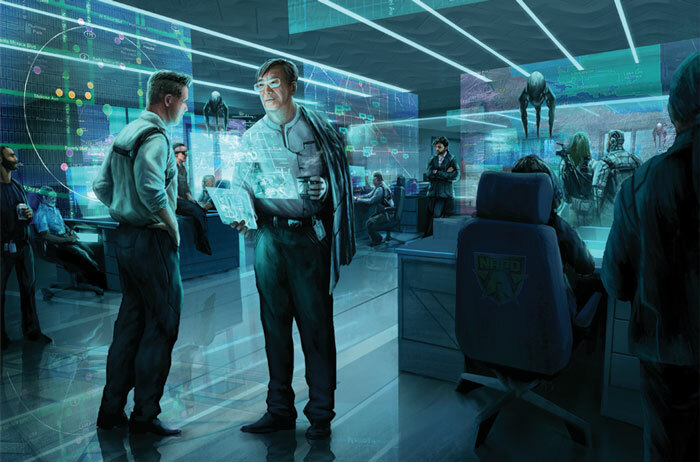 Thank you for making my time as the developer of Android: Netrunner such a memorable experience.